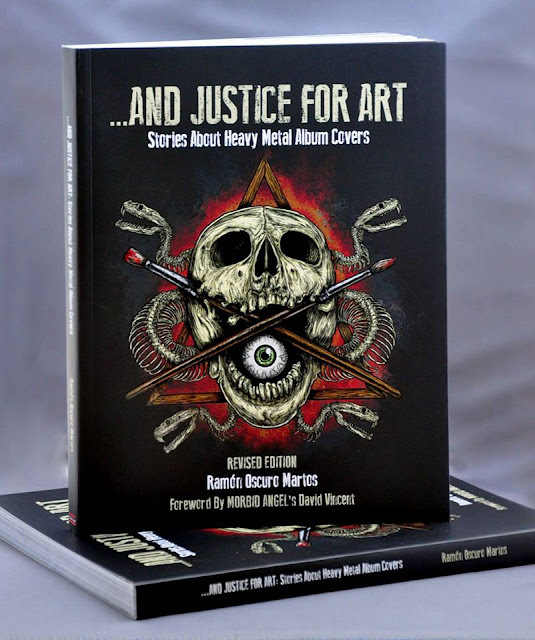 A limited, revised edition of the out-of-print book ...And Justice For Art: Stories About Heavy Metal Album Covers was recently released by indie publisher Dark Canvas. This one-of-a-kind collection of stories features more than 450 color graphics and recounts all the particulars behind the making of artworks as iconic as Slayer's "Reign In Blood," Morbid Angel's "Blessed Are The Sick," Metallica's "...And Justice For All," Mayhem's "Grand Declaration of War," Tiamat's "Wildhoney," Cradle Of Filth's "The Principle Of Evil Made Flesh," Black Sabbath's "13," and many more! The stories are told through 105 exclusive interviews with renowned musicians like Jeff Walker (Carcass), Charlie Benante (Anthrax), Max Cavalera (Soulfly, Sepultura), Fenriz (Darthrone), Sebastian Bach (Skid Row), Paul Masvidal (Cynic), Chris Adler (Lamb of God), David Vincent (Morbid Angel), Travis Ryan (Cattle Decapitation) among many others. 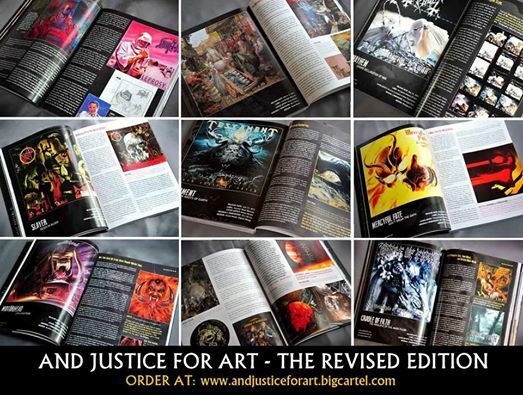 The book's Revised Edition also features new revealing commentaries by Dani Filth (Cradle of Filth), Dave Lombardo (Slayer), Kelly Schaefer (Atheist), Neige (Alcest) and by critically acclaimed illustrators such as Michael Whelan, Eliran Kantor, Dan Seagrave, Joe Petagno, Arik Roper and Travis Smith, just to name a few. When asked why he decided to create a revised edition, author Ramon Oscuro Martos—who writes for Metal Underground—says: "I didn't want to just re-print the same book again. I had new material available. So, I decided to introduce some changes that definitely bring something new to the table while keeping intact the essence of previous edition. There are new comments, more graphics, but it's still the same book... dramatically improved and updated." 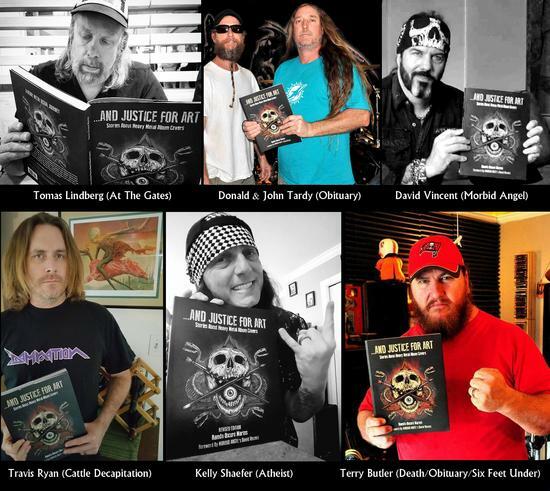 Metal musicians that have supported the book. The author believes that all the additions "make the book more complete. It's like what happens with an album or a movie: there's the original edition. Then you get the especial edition, the limited box set, etc... For me, this is it. This is the best version of the book I can create and it demonstrates that a creative work can evolve through time and become better, eventually... There's nothing wrong with that." The Revised Edition of '...And Justice For Art: Stories About Heavy Metal Album Covers' is limited to 300 copies and it's exclusively available right here. Great post.A paper is, for the most part, a bit of composing that gives the writer's own contention — yet the definition is ambiguous, covering with those of an article, a flyer, and a short story. Articles have customarily been sub-named formal and casual.Today most of the students depends upon best essay writing service .This services gives proper guide to write essay with excellent way. 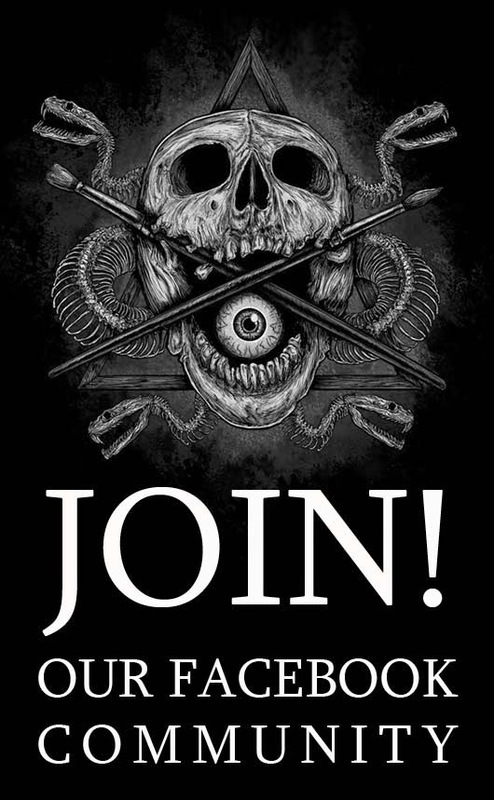 All books of Dark Canvas publisher are unique and unusual. They are the best presents for heavy metal fans. If you need help with https://mybestessays.org/write-my-research-paper search you can always find people on referring forums and ask them where you can find them. Your friends will be happy to get such limited items. Wow! I’m from Malaysia, an English teacher going to be. Now, I know that my goal readers are my students in the past. I’d like to mark like this too attractive event and real hard work to make an enormous article. Thank you for the suggestions, I really enjoyed reading this. It is so much inspiring. Art depends on the eyes of the beholder. I understand that a lot of people would not be able to appreciate this form of art but who cares right? It's not like they have the authority to meddle with another person’s beliefs. Whatever kind of music or form of art that you like, just try to be confident enough to show your passion for it! Many of the people today are trying to create their perfect professional resume and this one would really help them.